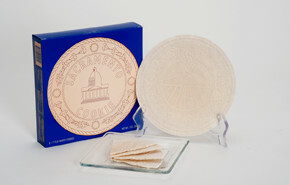 Since 1640 these gourmet wafers, traditionally called oplatky, have been hand made in the Czech Republic resort destination of Karlovy Vary, also known as Carlsbad. Fashionable among Europe’s elite, oplatky were eagerly consumed by the rich and famous. Some notable wafer eaters include Chopin, Wagner, Peter the Great, Goethe Edward VII of England, President Benjamin Harrison, and the Kaiser Wilhelm himself. As these luxury wafers grew in fame so too did imitations, inspiring variations like Oblaten in Germany and Carlsbad Wafers in England. Today there are only a handful bakers who still use the traditional recipes and techniques we adhere to in creating this scrumptious treat. Each crisp, light wafer is lovingly hand made then baked, aged twelve days, carefully filled with all natural filling and baked again. This process is tedious and time consuming, but take one bite of the delicious wafer and you are sure to agree it is worth the effort. 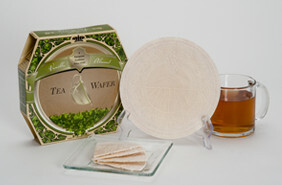 Our California Wine Wafers are ready to enjoy right out of the box with your favorite glass of fine wine. 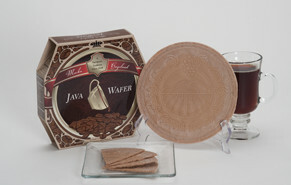 The wafers also make an elegant accompaniment to coffee, tea, sorbet and ice cream. Try serving with raspberries and Mascarpone cheese or create a decadent layered treat with lightly sweetened cream and fruit of your choice. Today there are only handful bakers who still use the traditional recipes and techniques we adhere to in creating this scrumptious treat. Each crisp, light wafer is lovingly hand made then baked, aged twelve days, carefully filled with all natural filling and baked once again. We still employ traditional hands on baking methods, opposed to mass production, therefore the color and appearance of the individual wafers may vary from batch to batch.